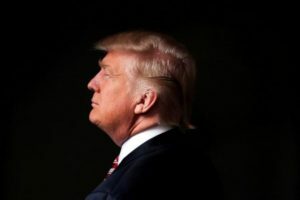 Once again, Donald Trump has proved his dangerous ignorance in matters of our environmental survival and democratic process when he held a rally in Fresno, California, on Friday. 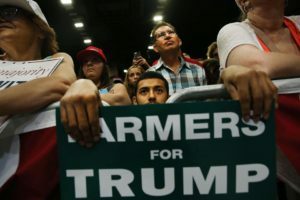 The presumptive Republican presidential nominee told California farmers just what they wanted to hear in a state where a long-time war has been waged over water. Trump speaking at Frenso CA. Much like the people he is appealing to, Trump erroneously claimed that California’s parched Central Valley is withering not for the four-year drought the state has suffered as a kickoff to global warming, but because environmentalists are trying to save the critically endangered Delta smelt. The tiny, luminous fish has become an emblem of loathing to Central Valley farmers since environmentalists tried to save it from dwindling rivers and creeks. But the fact is that the ocean food web – and therefore, the seafood industry — depends largely on the smelt population, which normally resides in deltas, swamps, and estuaries. In other words, the silvery blue, cucumber-smelling fish is near the bottom of the critical ocean food chain. Something smells fishy. 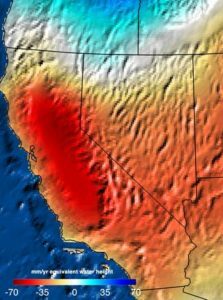 Trump’s claim of a rigged California drought does not hold water. In his speech, Trump falsely inferred that environmental policy makers have intentionally kept the delta pumps turned off to farmers so that they can nefariously dump the extra water in the ocean when no one is looking. It would be funny, if no one took the blowhard seriously. 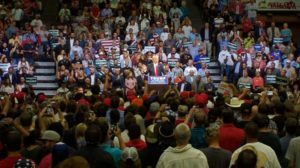 Unfortunately, the crowd in Fresno drank his Kool-Aid with more gusto than dehydrated prospectors lost in Death Valley. “If I win, believe me, we are going to start opening up the water so that you can have your farmers survive. 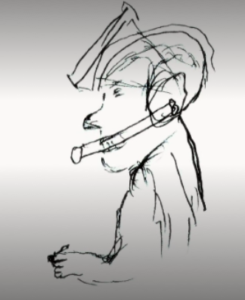 So that your job market will get better,” Trump said. Clappity clap clap, cheers, hoots and hollers. 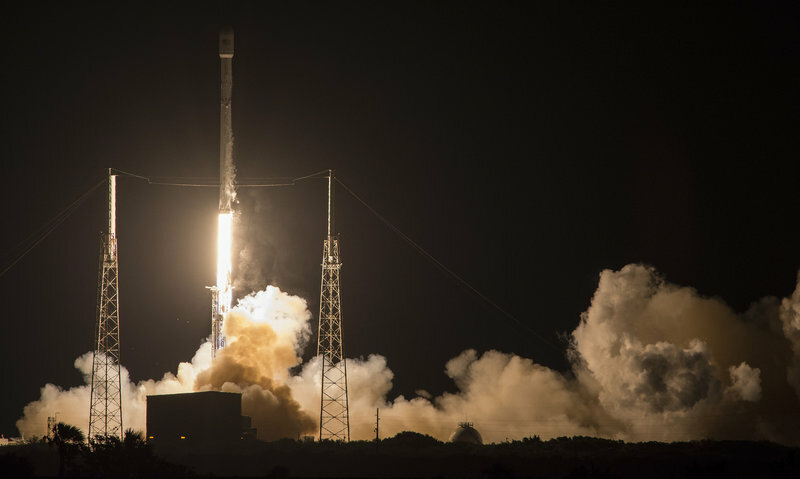 It’s three strikes in a row for Space X, which successfully landed the first stage of its Falcon 9 rocket last week on an “X” marked drone barge. In typical Elon Musk fashion, the company, which now has four booster landings to its credit, poured on a media blitz, including the dazzling video below of the Falcon’s descent and alightment onto the sea-borne dock. 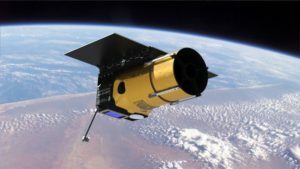 Planetary Resources Inc, the Redmond WA-based asteroid mining company, announced last week that it has hustled $21.1 million in capital to deploy and operate its highly-touted Ceres Earth observation business. Based on the firm’s model of exploring and exploiting asteroid resources, PRI intends to point its Arkyd spacecraft armed with the first commercial infrared and hyperspectral sensor platform to “deliver affordable, on-demand Earth intelligence of our natural resources on any spot on the planet.” The company is currently testing the Ceres sensor platform, which will be launched aboard an Arkyd 6 satellite on an upcoming Space X Falcon mission. Bryan Johnson, who led the financing campaign with his OS Fund, remarked that “With Ceres, Planetary Resources has leapfrogged traditional imagers for monitoring Earth’s natural resources, creating far-ranging opportunity. It’s a seismic shift for the new space economy.” If PRI is successful, our planet will be ringed by a constellation of 10 satellites constantly monitoring the globe as they serve multiple industries including agriculture, oil & gas, water quality, financial intelligence and forestry. Ceres will also be used to analyze the spectral signatures of crops and provide customized data to farmers, pinpoint energy and mineral resources, and eyeball pipelines and remote infrastructure. 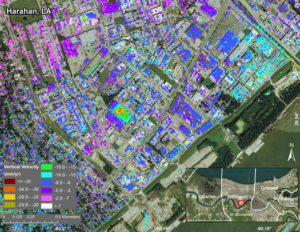 PRI also boasts that the system will capable of tracking toxic algae blooms, eyeball global water quality, and detect the early stages of wildfires. 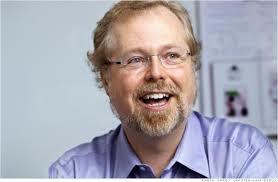 Nathan Myhrvold – ex-Microsoft Chief Technologist, billionaire patent collector, noted molecular gastronomist, award-winning wildlife photographer, and amateur paleontologist – apparently is bored, and has accused NASA in a paper submitted to the journal Icarus that the space agency’s statistics on potential killer asteroids are way off base. Basically Myhrvold, who’s had his finger in about as many pies throughout his adult life as humanly conceivable, is unimpressed with data NASA has obtained from its Wide-field Infrared Survey Explorer (WISE) spacecraft used to determine the size and reflectivity of 158,000 asteroids, claiming that the craft’s observations are “basically wrong.” Myhrvold contends that NEOWISE’s calculation could be more than 100 percent off, and that NASA researchers have failed to include Kirchoff’s law of thermal radiation in their models. 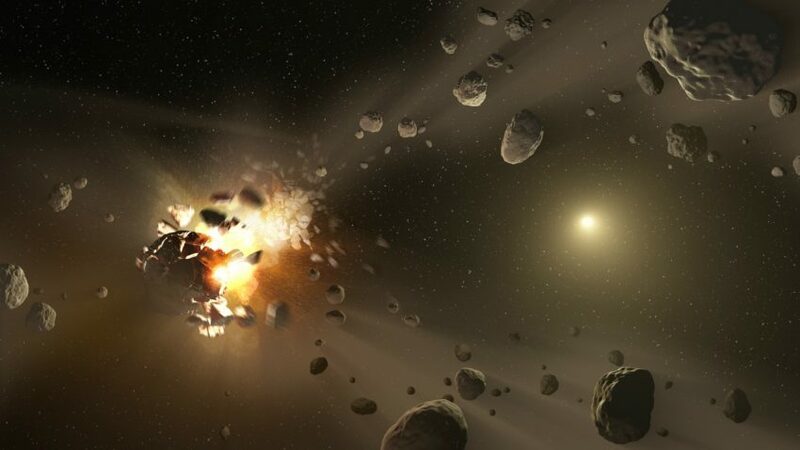 “Asteroids are more variable than we thought they were,” Myhrvold says. 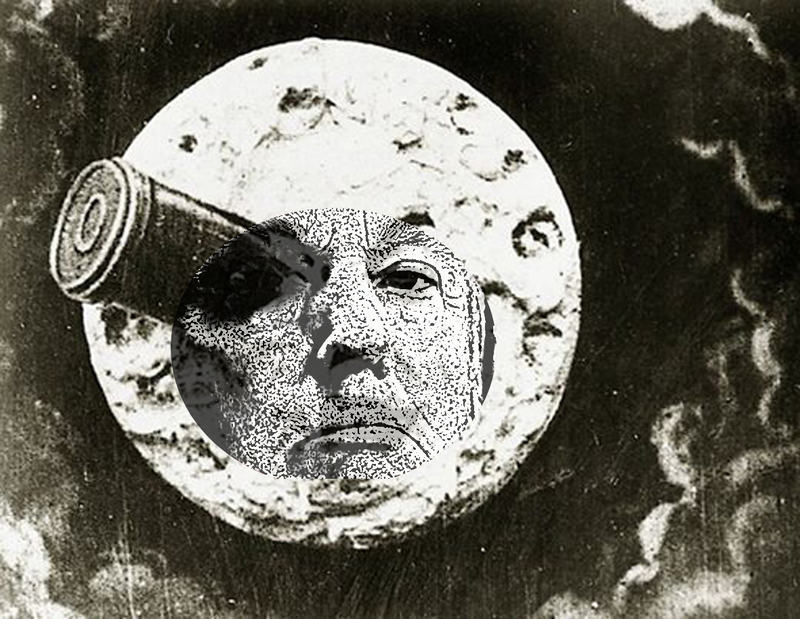 Responding to Myhrvold’s criticisms, NASA pointed out several mistakes and problems with his analysis. WISE principal investigator Ned Wright defended the WISE data, explaining that it correlates with two other infrared telescopes – AKARI and IRAS. “For every mistake I found in his paper, if I got a bounty, I would be rich,” Wright told Science. JPL scientist Amy Mainzer also cited problems with Myhrvold’s report, dryly noting the former Microsoft technologist’s confusion over diameter for radius. NASA’s planetary defense chief dropped the mic, saying while Myhrvold is an intelligent man but it doesn’t mean he’s an expert. NASA’s new Mother-in-law unit becomes fully deployed at the Space Station. After a stream of snarky press stories about how it failed to work, the space station’s new inflatable add-on module is now ballooned up and running after the crew gave it another whirl Saturday – this time swelling the module with air very, very slowly. 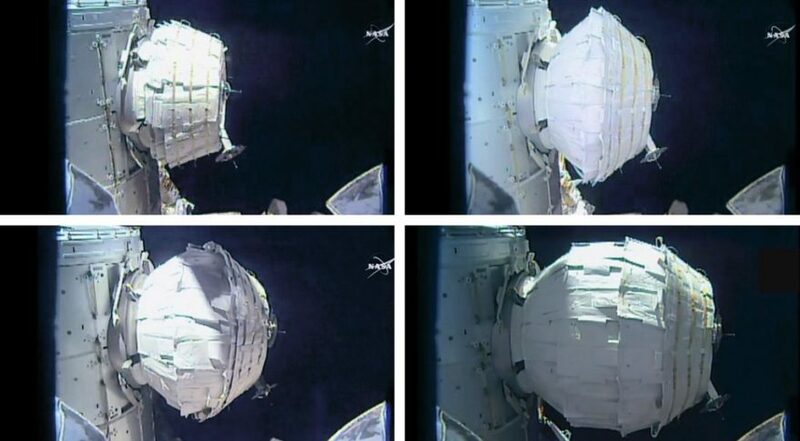 The experimental Bigelow Expandable Activity Module (BEAM) is the first of its kind on the ISS. 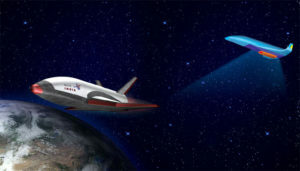 It is hoped the BEAM unit, which is light-weight and inflatable (and therefore economical), may be used in future missions — as both a deep space habitat and even a commercial space station. The crew is scheduled to enter the BEAM next week, after it’s fully checked for possible leaks, to outfit the handy add-on with sensors. It’s scary enough that sea levels worldwide are encroaching coastal communities faster than scientists had predicted, thanks to that “hoax” called global warming (Trump says it’s mere trickery invented by the Chinese to foil American carbon-belching industries). 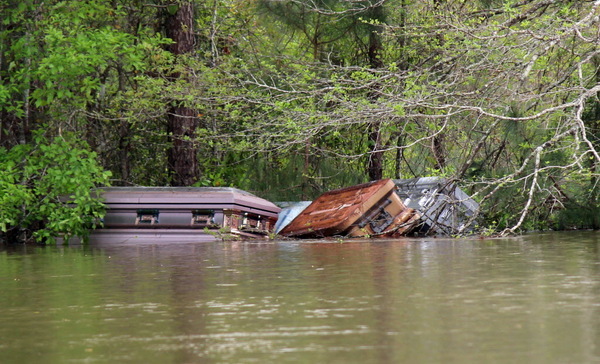 But couple the rising water with sinking land, and you get… yes, New Orleans. 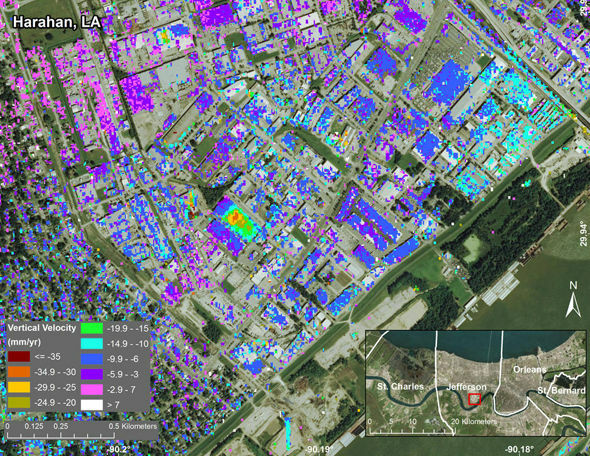 NASA announced results of a three-year study using sat images and airborne radar aimed at the Big Easy, and found that the city as well as the region surrounding it is sinking up to two inches a year in places. The sinking, drowning coastal area affected is home to more than a million people – but probably not for long due to the exponentially intensifying vanishing act of the ground beneath them. 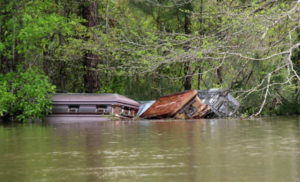 When land sinks, scientists call it subsidence, and blame much of that on over-pumping of groundwater. 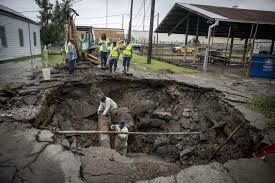 City work crews call it sinkholes, and apparently there’s an ocean of them peppering the greater New Orleans area. The U.S. is going to “renegotiate” the global climate deal we made with 200 other countries in Paris last Fall, said Republican presidential nominee Donald Trump – that is,“when” he gets into the White House. And why not? After all, Trump claims that global warming is a hoax invented by the Chinese to undercut the competitiveness of American business. “I will be looking at that very, very seriously, and at a minimum I will be renegotiating those agreements, at a minimum,” Trump told Reuters news service. “And at a maximum I may do something else,” added the narcissistic real estate mogul and orange creamsicle impersonator. Trump’s mindless drooling fans claim the madman “tells it like it is!” NOT. As he does with every other aspect of Constitutional and democratic processes, Trump again has undressed his bare stupidity and ignorance for the masses in telling them he will “get a better deal.” That’s not how this works. The Paris Climate Accord represents two decades of science gathering, negotiating, calculating and old-fashioned teeth-pulling between the 200 countries that finally agreed on it in order to save the planet from man-made carbon emissions – a fact that 99 percent of world scientists have admitted is truly happening. It is an agreement by the signing nations to cut greenhouse emissions to the point where the Earth’s temperature cannot rise more than another 2 degrees Celsius. It also pledges to provide money to developing nations for mitigation of rising sea levels and other consequences of climate change. 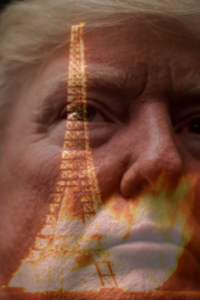 Were the U.S. to pull out of it, say climate experts, the entire deal could easily collapse between the other 199 participants. President Obama pledged a 26 to 28 percent reduction in greenhouse gasses by 2025. And Democratic presidential contender Hillary Clinton said she hopes to up that pledge to 50 percent reduction in emissions by 2030. Meanwhile, the rest of the world sighs at America’s mania for a dangerous moron like Trump. Recent NASA Landsat photo of Fort McMurray blaze. Six and a half meter RLV prototype being built near the fishing village in Kerala, India. India continues to prove that it has a place at the big people’s table of space faring nations with today’s planned launch of its much-anticipated space shuttle prototype. 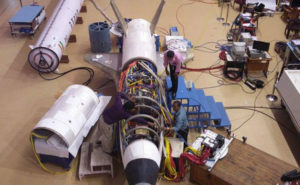 Conceived over 15 years ago, the sub-continent’s Reusable Launch Vehicle (RLV) program is now at a critical juncture as fingers will be crossed today while the 1/6 RLV model will be lifted 70 kilometers just beyond the threshold of space, and then free-glide back to Earth, with a controlled crash-land into the Bay of Bengal, according to NDTV. While the experimental craft will remain in a watery grave, India’s Space Research Organization will use data collected from the flight to pave the way for the final 40 meter long space taxi that is expected to have its maiden flight in 2020. In honor of Mars’ closest approach to Earth in 11 years, astronomers used the Hubble Telescope to take a close-up portrait of the handsome devil when it was about 50 million miles from us earlier this month. 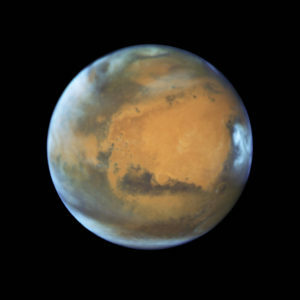 The pic, which reveals details as small as 20 miles to 30 miles across, was taken a few days before Mars’ opposition yesterday when the Sun and the Red Planet were on exact opposite sides of Earth. 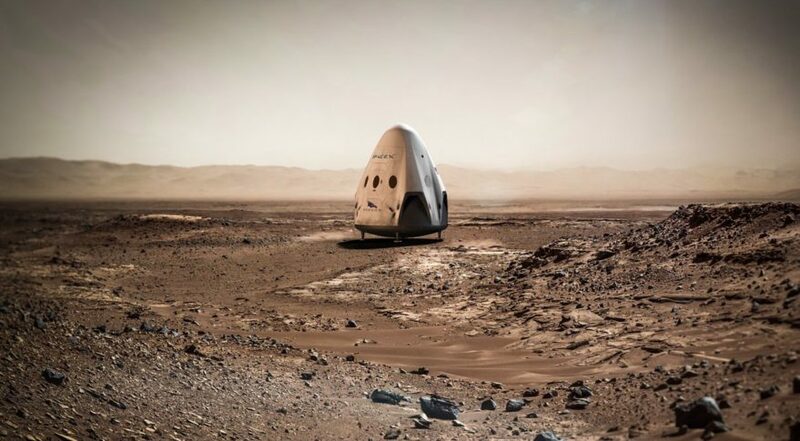 Next Monday Mars will be at a relatively cozy 46.8 million miles from our planet. 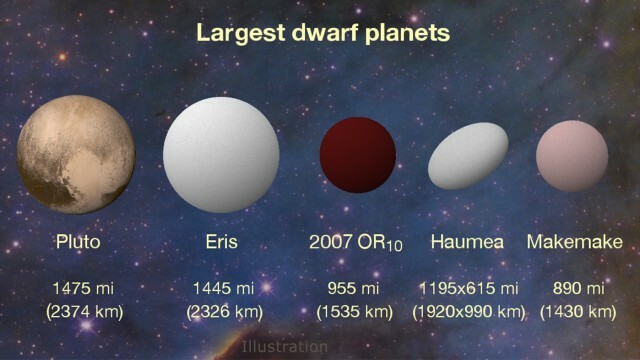 Scientists reporting in The Astronomical Journal last month have provided evidence of a previously undefined dwarf planet that appears to be the third largest in our solar system. The so-far unnamed 2007 OR10 was discovered beyond Neptune’s orbit, and was pinpointed using a data mash from the Kepler space telescope and thermal readings from the Herschel Space Observatory. Boasting a 1000 mile diameter, our newly-recognized diminutive celestial neighbor spins at a super-slow 45-hour daily rotation, and has an extremely dark surface area which is believed to be the result of constantly-changing methane ice. NASA’s New Horizons spacecraft, which over the past year has been flooding the space agency will stunning new data from its historic 2015 Pluto flyby, has found a new lease on life with observations of a 90-mile-wide Kuiper Belt object (KBO) orbiting more than 3 billion miles from the Sun. So far, New Horizons has twice examined space rock 1994 JR1, and has helped clarify some misconceptions on the nature of such far-flung celestial neighbors. “Combining the November 2015 and April 2016 observations allows us to pinpoint the location of JR1 to within 1,000 kilometers (about 600 miles), far better than any small KBO,” he said, adding that the more accurate orbit also allows the science team to dispel a theory, suggested several years ago, that JR1 is a quasi-satellite of Pluto,” said Simon Porter, a New Horizons science team member from Southwest Research Institute (SwRI) in Boulder, Colorado. From the closer April observation, NASA scientists were able to determine that JR1 rotates at a relative speedy 5.4 hour clip. On a related note, New Horizons is on course for an “ultra-close” flyby of another KBO, 2014 MU69, on Jan. 1, 2019. While supersonic micro-trash can cause relatively minor damage as with the ISS’s cupola window, orbiting debris larger than just 1 cm could penetrate the space station crew modules, while chunks bigger than 10 cm could shatter a satellite or spacecraft into smithereens. Hold on to your fascinator Queen Elizabeth! 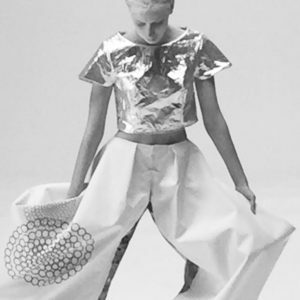 This week, London’s Science Museum and the European Space Agency will be sponsoring a “Couture in Orbit” hullabaloo in which five leading European fashion schools will roll out specially-designed clothes for the space age. 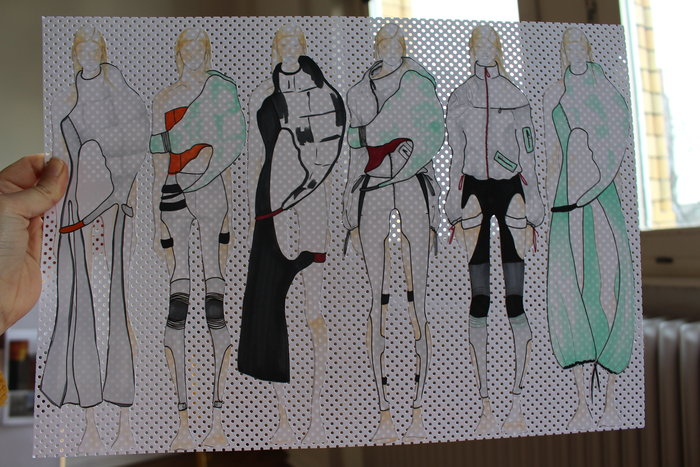 “This is not a competition but a celebration of the inspirational face of space exploration,” says ESA, which will have judges select 15 pieces from each school to be unveiled at the museum this Thursday. Each catwalk ensemble will be made with space-certified textiles supplied by ESA, as well as the firms Bionic Yarn and Sympatex. S p e c t a c u l a r S p e c t a c u l a r ! If successful, the artificial meteor show will be visible within a 62 mile (100 kilometer) radius, with a potential audience of 30 million people in the greater Tokyo area. According to the company, this 21st century pageantry is more than just flash and no substance. ALE’s ultimate goal is help better understand how spent satellites and other orbital debris can be safely disposed of in the Earth’s atmosphere. 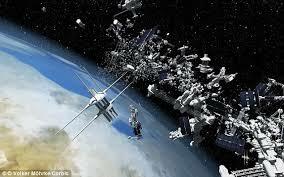 Finally – it looks like someone may actually do something about the ever-growing cosmic landfill orbiting our planet. A Singapore start-up company plans to launch a space debris cleanup machine to orbit in in 2018. The company, Astroscale, just found the right glue to equip their ADRAS 1 satellite which will seek out and trap the tons of space junk that endangers all space missions, future and current. That’s right: glue. These guys aren’t messing around; the company says their sole mission is to get rid of man-made space debris orbiting the planet. At this point, the ring of trash is so massive it’s probably visible to aliens eyeing Earth right now. Adras 1 will be able to automatically detect and maneuver towards space junk. It will then stick out an arm with the adhesive on it, collect the waste, and store it inside. 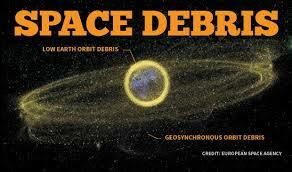 When the “trash sat” is full, it is designed to de-orbit, then burn up in the atmosphere. 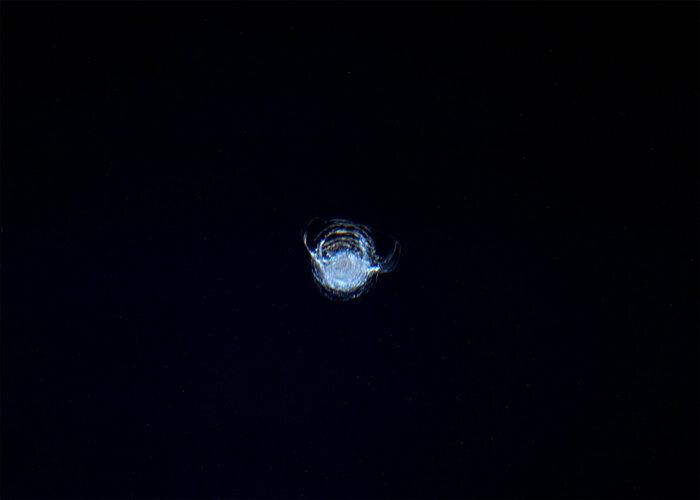 The question is, how many Adras satellites will it take to clean up the half million pieces of crap up there, each traveling at 17,500 mph? 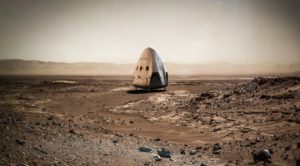 It’s not clear just how Astroscale will make money in their quest, unless every launch and space exploration outfit and agency on the planet wants to give the start-up a stipend for performing a public service. 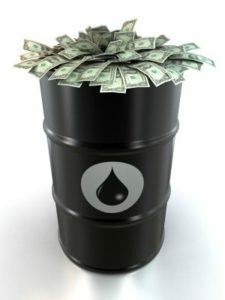 We are not sure Astroscale even cares about profit. A company engineer, Ait-Mohammed Nori, was quoted in Nature World News saying that based on her Japanese roots, space technology should not be developed for profit. 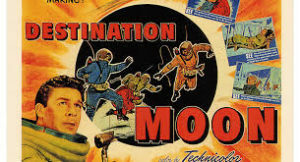 Their mission is to prevent man-made problems from hindering further development in space and to promote interest in space technology with the younger generation of Asian kids. 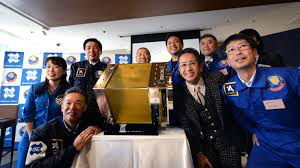 “They want to be part of something that will benefit the world, and getting rid of human-caused space debris will ensure the safety of future space missions,” said Nori. The Galactic Sandbox staff salutes Nori and her colleagues at Astroscale. We will be following their progress and cheering from the sidelines. 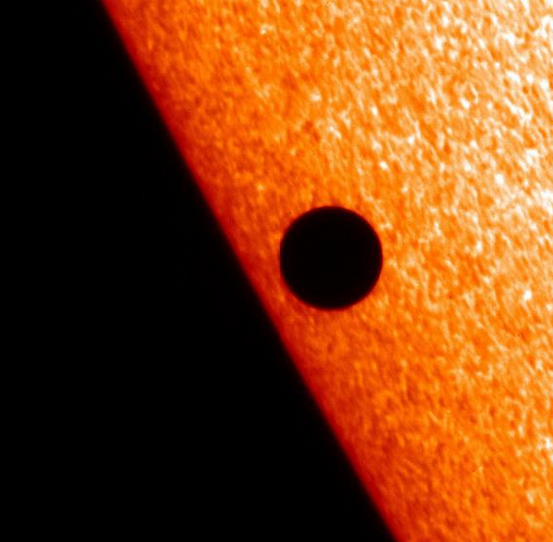 Mercury’s mini me eclipse of the Sun was photographed by the Japanese satellite Hinode in November 2006. Reminder: Today from 7:12 am ET until 2:42 ET, denizens of the East Coast of North America, most of South America, and Western Europe will have a front row seat to one of the rarest celestial shows as the planet Mercury glides across the face of the Sun (see Worlds of Wonder, May 2). Mercury transit watchers are warned to use protection including solar filters for telescopes – again NEVER look directly at the Sun without proper eye gear! 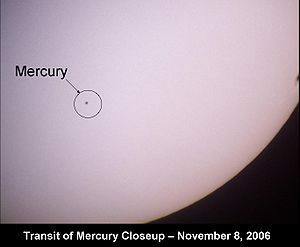 Given the relative size of Mercury to the Sun (it will be a black speck 1/158th the width of the solar disk), your best bet is to gaze online via live webcasts on Virtual Telescope or Slooh.com. 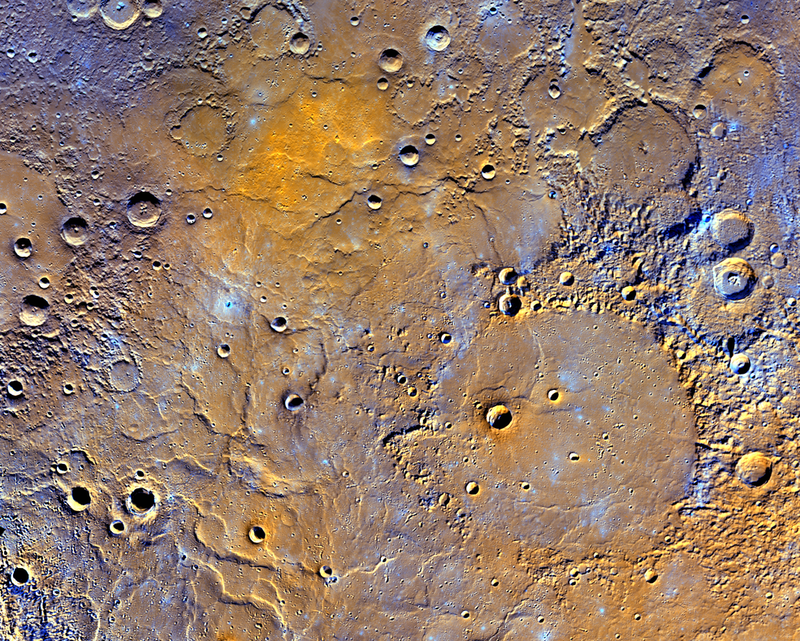 A view of Mercury’s northern volcanic plains includes the 181-mile- (291-kilometer)-diameter Mendelssohn impact basin (lower right), named after the German composer, appears to have been once nearly filled with lava. 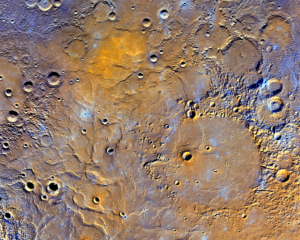 In a somewhat related item, NASA has released the first-ever topographical map of Mercury based on data collected by its now-defunct Messenger spacecraft that was forced into retirement last year after an eleven-year run when it was directed to crash-land into the innermost planet..This new map, stitched together with more than 100,000 images, features a variety of exotic topographical elements including the highest (2.78 miles) and lowest (3.34 miles) points on the planet. Elon Musk also made headlines as the featured guest at the World Energy Innovation Forum last Wednesday held at his Tesla factory in Fremont, California. 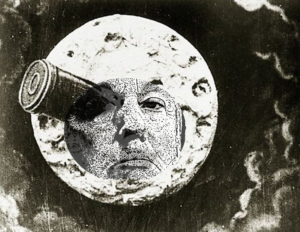 Musk rightly accused political leaders in the US and around the world of bowing to the “unrelenting and enormous” lobbying power of the fossil fuel industry, and warned that a global “revolt” may be necessary to make the jump to a fossil fuel-free world. The fundamental issue with fossil fuels is that every use comes with a subsidy,” Musk said. “Every gasoline car on the road has a subsidy, and the right way to address that is with a carbon tax. Politicians take the easy path of providing subsidies to electric vehicles, which aren’t equal to the applied subsidies of gasoline vehicles. It weakens the economic forcing function to transition to sustainable transport and energy. It is quite worrying, the future of the world,” he added. “We need to appeal to the people and educate them to sort of revolt against this and to fight the propaganda of the fossil fuel industry which is unrelenting and enormous. Woerner added that the ambitious project will be used for scientific experiments and as a pit stop for trips to Mars, and could also include mining and space tourism activities. 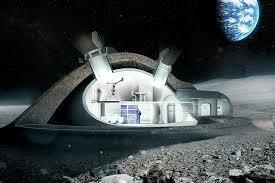 ESA recently proclaimed getting back to the Moon a priority for the agency, and like many others weighing in on the future of space exploration, said that the “village” would be a prerequisite for going to Mars. And as always, he relates everything under the Sun to his lifetime. While astronomers are drooling over the prospect of the James Webb Telescope – which won’t launch until 2018 and won’t start functioning fully for many months after that – the Hubble Space Telescope is still finding unimaginable wonders. The latest is a star surrounded by a bizarre structure called The Red Rectangle. 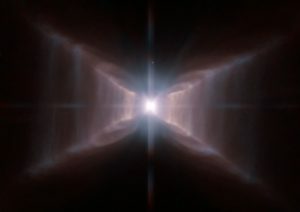 Hubble snapped pix of HD 44179 earlier this month, and the star gives off a reddish-orange glow which is caused by hydrogen surrounding a proto-planetary nebula. The sun in the middle of the pic is actually much like our own, but is on its way to becoming a hot white dwarf star. 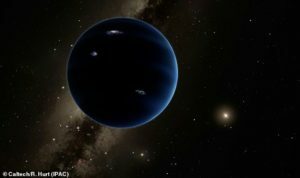 In only the second year of its five-year mission, the Dark Energy Survey (DES) is rip-snorting at full speed… and happens to be gazing at the sweet spot in the sky where fabled “Planet 9” could be – the super Earth 10 times bigger than our own that could be lurking near the edge of the Kuiper Belt some 2.5 billion miles away. While astronomers bicker whether the behemoth “shadowy” planet exists or not, the Dark Energy Survey is spying at the area wherein the Cassini spacecraft rekindled the old squabble a few months ago as it detected a gravitational nudge, fueling renewed hope for the pro-Planet 9 cheerleaders and a bounty of glossy science magazine fold-outs in February and March. The DES just might end the argument once and for all if it finds the seemingly invisible planet. NASA says it is too early yet to confirm if Planet X exists or not. 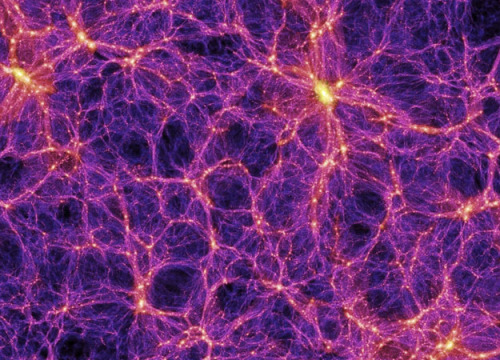 Meanwhile, the Dark Energy Survey continues unmasking some mysteries for cosmologists, a big one being that the cosmos is flying apart much faster than previously thought. The DES has helped create new massive catalogs of the distorted shapes (caused by gravitational lensing) of 24 million distant galaxies in what is now viewed as the “cosmic web” of our particular Universe. Russia christened its spanking new $3 billion Vostochny spaceport last week with the launch of a Soyuz 2.1a rocket toting three satellites into orbit. According to SpaceFlight Now, Russian President Vladimir Putin was on hand for the inaugural liftoff that was originally slated for broadcast live on the Russian space agency’s YouTube channel, but was actually streamed with a few-minute time delay. 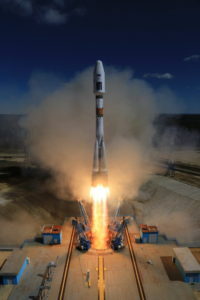 Ensconced in Russia’s Far East forests, the Vostochny Cosmodrome is that country’s first home-based spaceport that is intended to take over the bulk of “heavy lifting” activities from the Soviet-built Baikonur facilities located in Kazakhstan. Believed to have lost its solar panels, Japan’s abandoned Hitomi space-based X-ray observatory was designed to hunt for black holes. 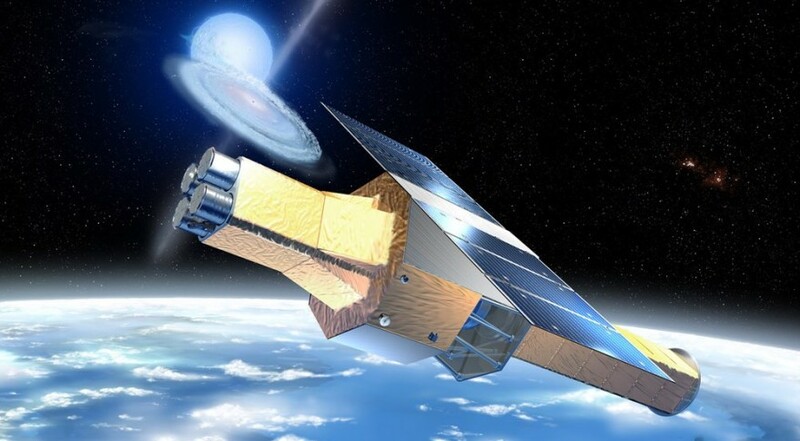 Japan’s flagship Hitomi X-ray Observatory was officially relegated to the cosmic dust bin last week, as that country’s space agency failed to regain communications with the craft that is thought to have broken up in orbit. 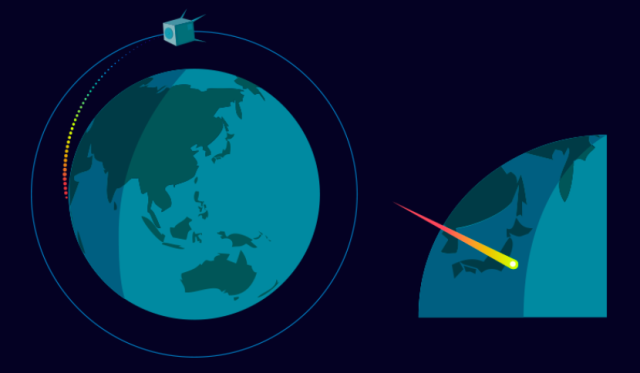 In late March, scientists believed that the doomed X-ray astronomy satellite was still sending signals after it started orbiting out of control, however upon further analysis they discovered the transmissions were coming from a different source. Japanese engineers are now trying to determine why the craft started falling apart only a few weeks after launch. 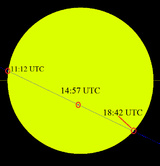 One of the rare celestial treats will occur next Monday, May 9, when the planet Mercury passes across the face of the Sun. Known as a planetary transit (or as the Burlington Free Press playfully calls it “A little black spot on the sun in May”), next week’s Mercury photo bomb of our home star marks only the fourth time in 17 years such a mini eclipse has happened (a rarer, more famo us Venus transit occurs in pairs with each event separated by eight years every 121.5 and 105.5 years respectively). Next week’s phenomenon will be visible in its entirety (use special eye protection – DO NOT LOOK DIRECTLY AT THE SUN!) from western Europe and Africa to Eastern North American and most of South America. And it’s not an imagined dragon-like object misconstrued by UFO Sightings Daily, either! 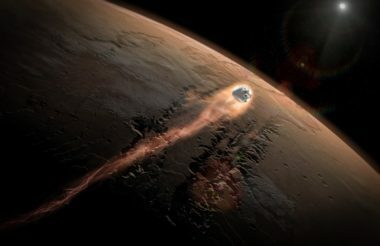 SpaceX announced last week that they plan to land an unmanned Dragon capsule to the surface of Mars by 2018, as a “technology demonstration mission.” The company said the now famous Dragon 2 craft will be dubbed “Red Dragon,” lifted by a Falcon Heavy launch vehicle – using some expertise from NASA, but none of the agency’s money. 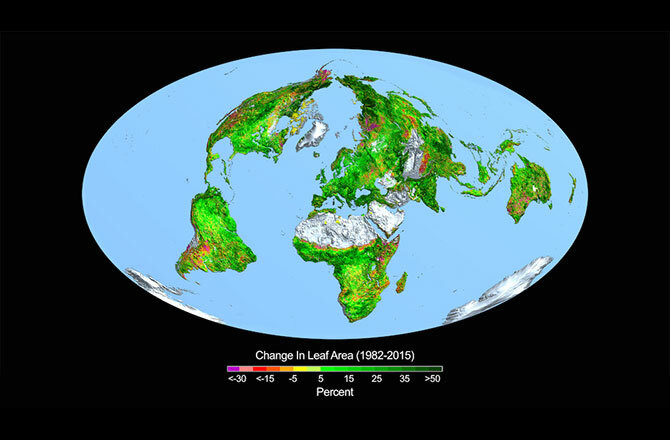 To isolate what causes planetary greening, scientists from around the globe have analyzed satellite data collected by NASA’s Moderate Resolution Imaging Spectrometer and NOAA’s Advanced Very High Resolution Radiometer instruments. 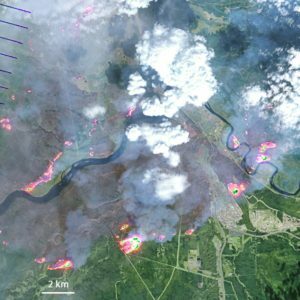 With the use of this satellite data, the team concluded that about 70 percent of the increased vegetation growth could be caused by carbon dioxide concentrations. 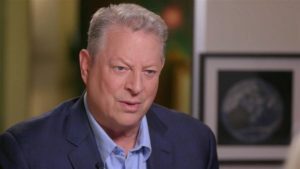 Apparently it’s easier to be green, at least for the Earth, since increased levels of CO2 have been spewn into the atmosphere over the past few decades. According to a new study published last week in the journal Nature Change, carbon emissions between 1982 and 2009 have contributed to a global plant population explosion equivalent to twice the size of the continental U.S. “While our study did not address the connection between greening and carbon storage in plants, other studies have reported an increasing carbon sink on land since the 1980s, which is entirely consistent with the idea of a greening Earth,” said study co-author Shilong Piao, of the College of Urban and Environmental Sciences at Peking University. Before you think, “Gee, isn’t this a good thing?” researchers somberly add that the harmful consequences of excess CO2 such as global warming, melting glaciers, rising sea levels, and extreme weather still outpace any benefits from the oxygen provided by additional greenery. And it looks like the lusher vegetation may only be temporary. “Studies have shown that plants acclimatize, or adjust, to rising carbon dioxide concentration and the fertilization effect diminishes over time,” said Philippe Ciais, associate director of the Laboratory of Climate and Environmental Sciences in Gif-sur-Yvette, France. 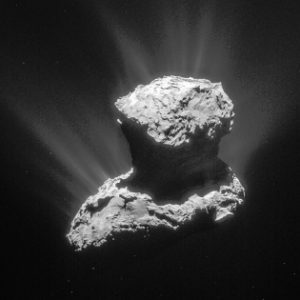 The world of astronomy is abuzz with the discovery of the first-of-its-kind “tail-less” comet that scientists believe was formed near Earth at the time of our solar system’s creation. The newly-found C2014 S3 celestial wanderer, nicknamed Manx after the tail-less cat breed, is believed to have been ricocheted to the uber-frigid Oort cloud where most comets are formed, and has now returned to its birthplace most likely for the first time since it was spawned 4 billion years ago. Spectral readings show that the Manx’s materials haven’t been “baked” by the Sun, as is the case with other local orbiting asteroids, meaning that it most probably has been hanging out with trillions of icy “half siblings” in the deep frozen Oort cloud. “We already knew of many asteroids, but they have all been baked by billions of years near the Sun,” said the study’s lead author Karen Meech in a press release. 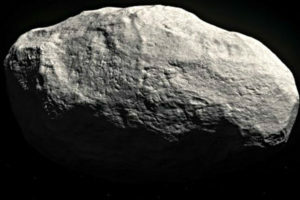 “This one is the first uncooked asteroid we could observe: it has been preserved in the best freezer there is.” Since the Manx has undergone “very little processing,” researchers believe this is the first time it has been ejected from its frozen home since it arrived there.